Now the site is cleared the first job is concrete footings to place the sea container. The container is to be used for site storage during the building stage and then as a workshop once building is completed. All concrete has to be pumped in due to the sloping site . 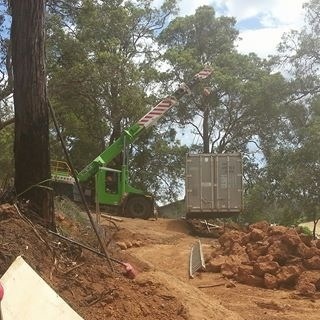 Once the container was in place formwork was erected to create the 2.4 metre high retaining walls that would encase the container and later be part of the underground fire bunker.